We are in the midst of some bad thunderstorms - luckily, they have been intermittent, but get strong. I shopped at both Whole Foods and Weaver Street Markets yesterday and am well stocked with food. At Weaver Street, they had on 99 cent clearance a (4 or 5 ounces) bag of fresh "living" watercress that needed to be used in a day or two. 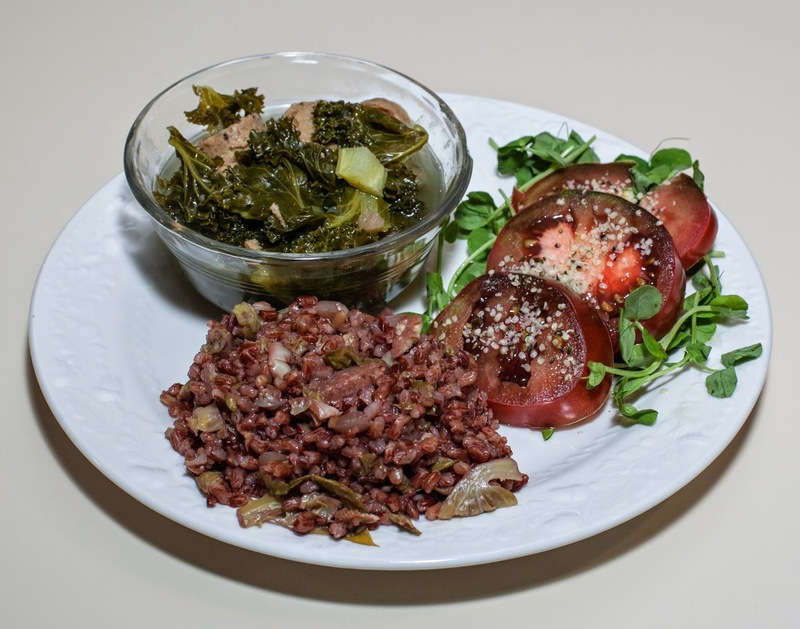 I solicited feedback on good dishes to make with watercress, aside from eating it in a salad. My friend Paul suggested that it is "great for soup with onions, potatoes, and sweet corn"; I found online a nice sounding chilled cream of corn and watercress soup that sounded tempting, but I decided to just take some basic inspiration and make my own. One thing that has impressed me about my new Instant Pot electronic pressure cooker (and steamer, slow cooker, yogurt maker, ...) is that everything seems to turn out great. I like making soups occasionally in my Vitamix blender, but I find that my intuition on soups in the blender isn't as strong. I decided to put a number of ingredients, especially potato and watercress but not too many others to take away from their defining flavors, in the pot with homemade unsweetened rice milk, use the pot's "soup" button, and then take out maybe a third of the finished soup, puree it in my blender, and then return to the rest of the soup. Here is what I actually did. I put all the ingredients except for the basil in the Instant Pot, closed the pot, and pressed the "Soup" button, which the pot translated into a 30 minute high pressure cook. I was thinking of adding the fresh basil at the end when I served, but I sampled the soup before serving and it was so good and rich that the basil would have been lost in it (instead, I used the basil atop tomatoes on the side). That's it! Since my appliance cooks at lower pressure than the old-fashioned stovetop pressure cookers, this is probably equivalent to a 20 or 25 minute high pressure preparation in one of those. I also made a kale side dish by putting a medium shallot, sliced into 1/2" slices, into a stainless steel pan. I cooked over medium heat with nothing else added for 2 minutes or so, stirring, then added about 3 ounces of tempeh cut into approximately 3/4" squares. I cooked, stirring, another 2 or 3 minutes, then added a head of red kale leaves, hand torn into approximately 1" squares. After stirring for a minute or so, I added a few tablespoonfuls of coconut aminos (low sodium soy or tamari sauce could be used), stirred, and served. Dinner was great! I had made a simple dinner for my daughter earlier, so was free to add jalapeno. This particular one was hot, but ended up fine with the soup. I didn't blend the soup or do anything else. The broth was quite rich and the vegetables, especially the carrot, perfectly cooked. The scallion and watercress were broken down into a less formed green graffiti and added nicely to the flavor. Both my wife and I loved the soup. I couldn't think of any improvements! The kale was, of course, good. How can one go wrong with heirloom tomatoes, which I also served?! A cup of almond milk is around 3g of fat, and the soup made about 4 servings, so the meal was only a few grams of fat. That makes it an almost no added fat recipe in my book! I need to keep on making soups with the Instant Pot. I haven't been particularly drawn to soups, but this pot makes such tasty and rich soups that I may be making more soups now on. By the way, strawberry season at our favorite local farm, Whitted-Bowers (biodynamic and organic), opens in two days, this Friday May 2nd! I should make some homemade jams. I wonder if I could use or modify recipes like this one from epressurecooker.com or this one from hip pressure cooking (maybe with brown rice syrup or Bee Free Honee). I like the shape and form of Romanesco cauliflower - and it tastes fine, too. It's actually an older variety of cauliflower than the standard white one and has been grown in Italy for at least 500 years - but only commercially grown in California since the 1990s. But I don't buy it often as it's usually expensive. My wife picked some up a few days ago, so I wanted to highlight it in a meal, which I did tonight. Head of Romanesco cauliflower, florets removed. This would probably work just as well with regular (white) or yellow cauliflower (I wouldn't use purple unless I had some light and contrasting colored ingredients). About 2T of green garlic chopped into a 1/4" dice. I happened to get this immature garlic at the local farmer's market on the way home today, but a clove of garlic or, perhaps better and milder, a small shallot bulb, could definitely be substituted. About 1/4 cup roasted red pepper, cut into 1/2" chunks. Juice of one small tangerine. Pinch of salt and 1/4 to 1/2 t dried tarragon. (Optional) Bit of diced jalapeno, according to personal preference. I then added the cauliflower and continued to stir for another 2 minutes or so, slightly darkening the cauliflower. I added the roasted red pepper and stirred for half a minute. I added the juice, salt, tarragon, and jalapeno. I stirred, then covered the pan and let the food simmer on low heat for about 10 minutes till the juice was almost all absorbed. I served along with the other dishes. I had made a simple pizza and raw kale for my daughter, so I was able to use the jalapeno. My wife and I quite liked the dish! Perhaps because of the yellowish tinge, it reminded us of an Indian cauliflower dish. It was quite good! The dinner worked well together and was tasty and filling. I probably will only occasionally use Romanesco or purple cauliflower - they're not available year-round here and are expensive. I hope to continue to experiment with new ways to prepare Romanesco cauliflower when I do buy it. Purple cauliflower tastes a lot like white cauliflower - I should make more regular cauliflower dishes, such as in stews or roasted and mashed. We had a friend in town from California on business, and had the good fortune to have him as our dinner guest tonight. Though he is vegetarian (but not vegan), he probably hasn't been exposed to a lot of no-added-fat cooking, so I wanted to make a meal where he wouldn't notice that there was not much fat. 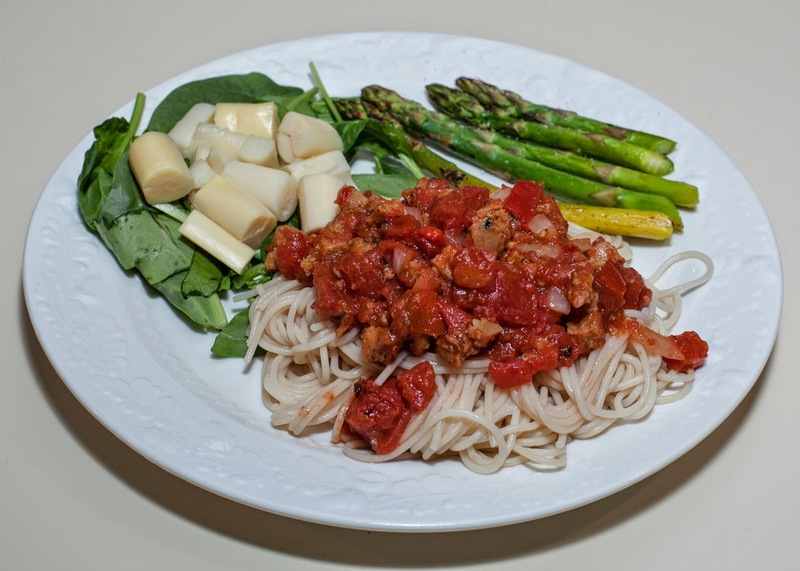 I thought that the vegan "cheese" sauce that is from the PCRM FFL diabetes curriculum and that I made on March 31st for our dinner would be good, especially since my daughter loves this and will eat it plain. It's a fun and easy sauce to make and does not contain much fat. I rarely use oil in sautéing anymore, but occasionally use a bit to get browned tempeh or browned seitan. I decided to make seitan not with oil but also not in stainless steel, but rather in one of my well-seasoned cast iron pans (without adding any oil). I also thought it would be fun to get to know my Instant Pot programmable pressure cooker / steamer / slow cooker / sauté pan / yogurt maker better. This is what I did. I put about a cup of water in the Instant Pot as well as the included steamer basket. The water was below the bottom of the basket. Inspired by a pressure cooker recipe for Brussels sprouts with pomegranate and pine nuts, I put the Brussels sprouts into the basket (it's really not a basket but a mesh) and set the pot to a manual program of 3 minutes of pressure cooking with a setting of high pressure and steam release set to the quick mode (i.e., venting and not sealing). The pan worked like a charm - it takes a while (10m?) to get enough pressure, then counts down from 3 minutes till done. I removed the sprouts from the pan (I couldn't resist trying two sprouts, one of which had fallen to the bottom out of the steamer mesh, once they cooled - wow, these were perhaps the most perfectly cooked Brussels sprouts I've had! The one that had fallen had some carmelization from the heat of the bottom but was actually perhaps even tastier!) and kept them in a large bowl. The stainless steel bowl of the Instant Pot was a little brown, but I swished a little water in and it cleared up easily. I then added the bouillon cube, a cup and a half of water (more than in a recipe I found about pressure cooking fingerling potatoes), the potato, carrot, and garlic. I closed the lid and again used a manual program of 6 minutes - again with venting (quick mode) and high pressure. Once the vegetables were done, I opened the Instant Pot, tossed back in the Brussels sprouts, stirred, and served, topping with the cheese sauce described next. I put all of the ingredients into my Vitamix blender (any blender should do) and blended on high till homogeneous, about 30-45 seconds. I poured the orange liquid into a stock pan. When the other dishes were ready and about to be served, I gently heated over medium heat the liquid, stirring constantly. Within 2-3 minutes, the "cheese" nicely thickened, and I then served atop the vegetables described above. I didn't describe the seitan or salad, but they were quite straightforward. The salad was just chopped tomato, fresh basil, a bit of sweet onion, a dash of ume plum vinegar, and a bit of salt and pepper all mixed together (I also added some jalapeno after serving my daughter the "unadulterated" salad). For the seitan, I marinated an 8 ounce packet of seitan strips in the juice of a tangerine (I marinated for an hour, but overnight would have been better). After draining the seitan, I sautéed it with about a third of a small sweet onion cut into thin 1/4" half moons and then cut into halves. I served my daughter this side dish, then mixed in jerk seasoning for the adults. I think that dinner came out great! I loved how the Instant Pot made the vegetables, and the combination with the sauce was very good. 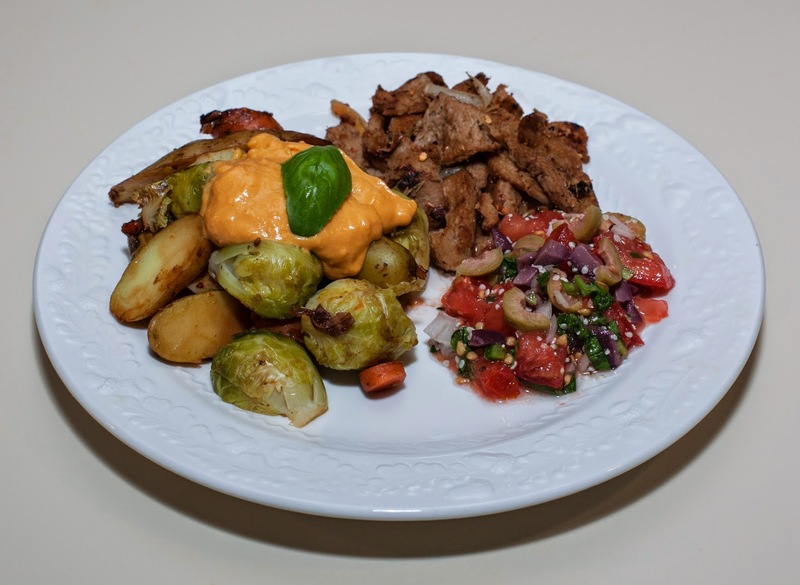 How could seitan with jerk seasoning and a tangerine marinade not be tasty? It was, and was our friend's introduction to seitan. The salad was good; I should make chopped salads more often - and be sure that I have access to fresh basil as much as conveniently possible. I am impressed with how well vegetables cook under pressure. This may be the best Brussels sprouts I've had, and I liked how the potatoes were uniformly cooked. I guess that the skins need to be pierced so that the pressure won't pop out fragments of the skin. I call the meal "almost no added fat" because the only significant source of fat is the cashew. That only contributes about 7g of fat for the 1/8 cup of nuts, and that covered four servings (actually more, as my daughter ate some of the sauce plain). I had a bit of a problem the first time that I used the Instant Pot last Wednesday, but the excellent customer service helped me to identify the likely issue was that I overfilled the pot (it should not go beyond 2/3 full, and it's possible I was just a bit over). This time, all went great, but I need to clarify whether it's okay to pressure cook in the venting position. While I remember reading that it was, I wonder how the pot gets up to pressure. I also wonder if things would be speeded up if I used heated (boiling?) water to start. I'd love to make more dishes like this with a "cheese" sauce topping. I'll bet a mixture of some bigger grains (barley?) or pasta with vegetables would go great with the sauce. I look forward to continuing to integrate my new electronic cooker into my kitchen. My wife attended a house concert while I took my daughter to the birthday party of one of her friends. 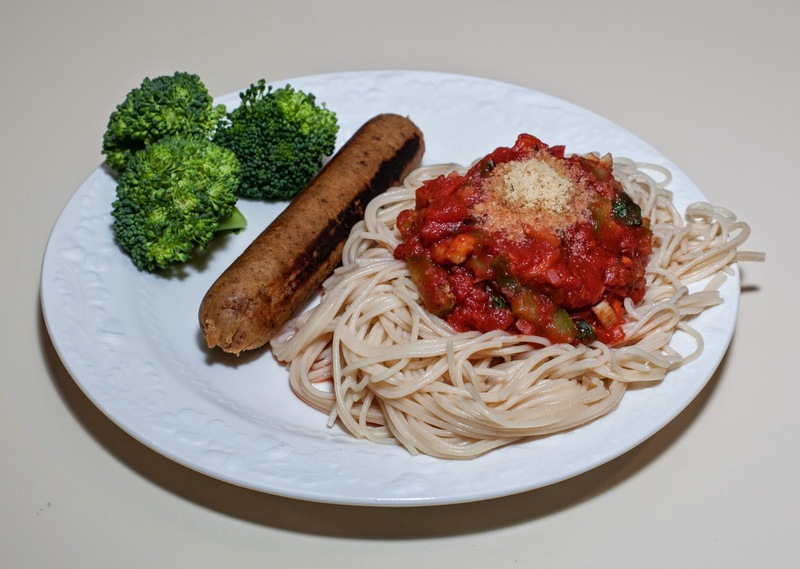 Dinner was just kiddo and me, and it was getting late, so I made a simple pasta and vegan sausage dinner (she had smoky tempeh which she used to say she loved - but tonight was finicky with it - instead of sausage, and also had raw kale). A few days ago, I took delivery of an Instant Pot IP DUO 60 (6 quarts). It is a programmable pressure cooker, slow cooker, rice cooker, steamer, sauté pan, and yogurt maker. The idea of getting an Instant Pot came from exploring making homemade vegan yogurts. I've never before done pressure cooking, but now I will be able to explore that world, as well as having a larger slow cooker (6 quart stainless steel cooking bowl vs. 1.5 quart ceramic one in the dedicated slow cooker). For rice, I nowadays use quick cooking whole-grain rices like Madagascar pink, jade pearl, and brown basmati, and will probably continue using my Saladmaster and other stock stainless steel pans, and stick with the dedicated Zojirushi rice cooker for longer cooking rices (I found a nice article on cooking rice). I don't steam often but hope that this Instant Pot will work well to retire the plastic consumer vegetable steamer that I have. I put all of the ingredients except the sausage and black pepper into the Instant Pot and added enough water to cover the ingredients. 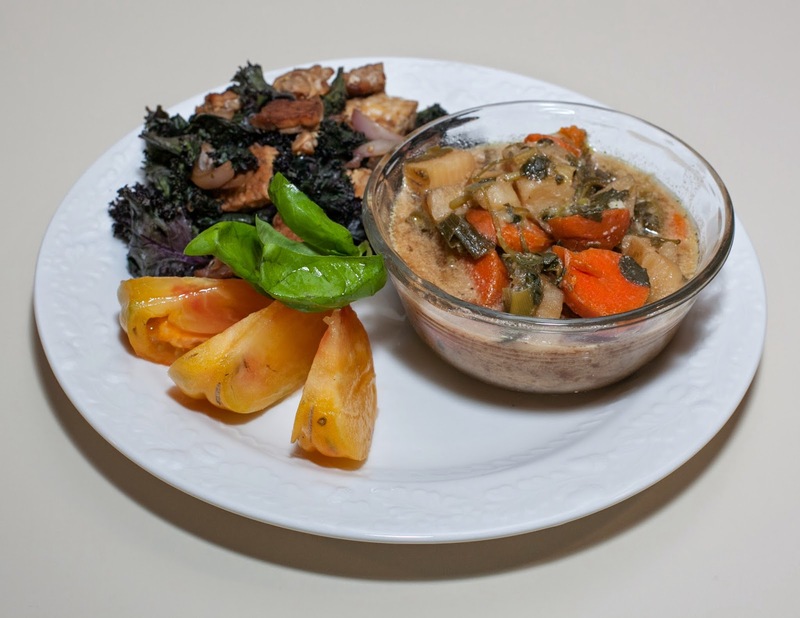 I programmed the Instant Pot for 6 minutes of pressure cooking at high pressure (the Instant Pot uses a lower pressure than non-programmatic pressure cookers, so this recipe would cook in less time using a traditional pressure cooker) and let it go. All this meant was selecting the "soup" setting, keeping the pressure release in "steam" mode, and manually dialing down the time to 6 minutes. Once the beeper went off that the soup was done, I opened the lid (being careful so that the little escaping steam was directed away from me), added the sausage and black pepper, stirred, and served. I served the soup with rice (I sautéed some onion and 4 finely chopped Brussels sprouts, then added about 2/3 cup of Bhutanese red rice, 1 1/2 times as much water, and a cube of vegan bouillon cube, and let it simmer for about 20 minutes). A simple salad of locally grown pea shoots topped with heirloom tomato slices and hemp seeds completed the meal. I call this almost no-added-fat because the only substantial source of fat was the vegan sausage. It has 10g of fat per link, but the soup was more than enough for the three of us, with at least 2 or 3 servings remaining as leftovers. I also ate three bowlfuls, so this really made at least 8-10 servings, or about 2-3 grams of fat per serving. That said, the soup seemed to be done. I thought that it was pretty good, but had too much broth; I'd make it with at least a third less water next time. It could have used a bit more flavor; perhaps some stewed tomatoes would have been good, as well (were I not cooking for my child, too) as some jalapeno. My daughter liked the soup, but my wife "didn't dislike" it. She found that I didn't cut the kale down to small enough pieces, and found the soup more like a stew, and difficult to eat. She thought that this was a good first try with the Instant Pot. The rice was good. I don't remember when I last used Bhutanese short-grained rice. I do like it, but much prefer Madagascar pink or jade pearl. I liked the pea shoots but neither my wife nor my daughter did. I know that this is the tip of the iceberg even just about pressure cooking. I am impressed with the solid build quality of my new appliance and the promise of all that it can do, and look forward to exploring especially mixed cooking (maybe a sauté, followed by slow cooking and ending with pressure cooking) with my new Instant Pot. We are low in groceries as we've not shopped in a number of days, so I was a little concerned about what I'd make today. I succeeded in making something that came out well. Without adding any liquid or fat or anything else, I sautéed a little onion in a small stock pot, then added chopped roasted red bell pepper. A minute or so later, I added a little water, a tablespoon of chickpea miso, and some black-eyed peas. I cooked, covered, adding a bit more onion and some green bell pepper shortly before serving. It came out quite well! 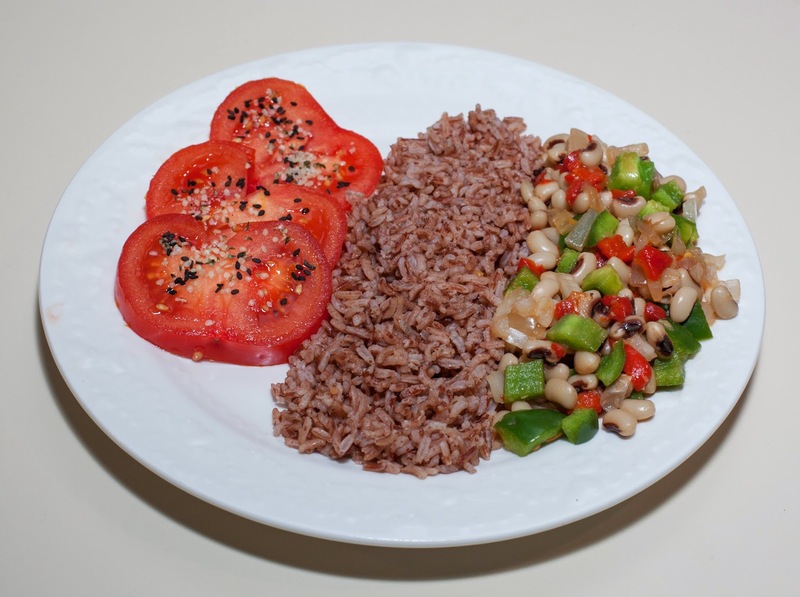 I served Madagascar pink rice and slices of tomato with black sesame seed (good source of calcium) and hemp seed (with omega-3 fatty acids), as well. My daughter loved the soup yesterday, so I made a similar one tonight. We had been enjoying my favorite local event the past four days, the country's biggest documentary film festival, Full Frame. 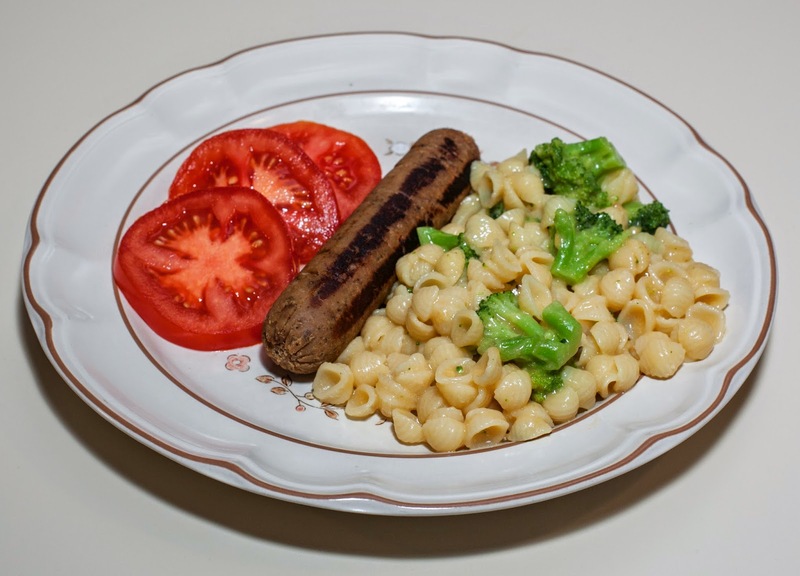 Other than a quick and easy vegan macaroni and cheese dinner that I made for my daughter and me on Thursday night, we had been eating out in the short gaps of our viewing schedules. Now, we're a bit low on ingredients and need soon to shop again. I found two golden beets in the refrigerator and decided to work with them. I came up with a main dish with the beets, sweet potato, and bell pepper with raw quinoa added in the last 10 minutes or so. I also made a side dish of tempeh. Here is what I did. In an uncovered medium stock pot, I brought about 4 or 5 cups of water to a boil then added the beet and sweet potato cubes and cooked over medium heat. About 3 or 4 minutes later, I added the first batch of onion. I rinsed the bell pepper and then put it on my gas range. I turned the range on to flame roast the pepper, turning the pepper to a "green" side as it charred. After a few minutes, I had a mostly black bell pepper. I put the pepper in a brown paper bag and crumbled the bag closed. I let the pepper sit in the bag for 10 minutes or so, so that the smoke flavor could be nicely absorbed. I took the pepper out and, under cold running water, gently rubbed it to remove most of the charred skin. I cut the pepper open, removed the seeds, stem, and membrane, then chopped into approximately 1/2" - 3/4" cubes. Cut so small, both the sweet potato and beet cook pretty quickly. Once they were just tender to gentle fork pressure (about 10 minutes total), I stirred in the bell pepper cubes, quinoa, and bouillon cube. I continued to cook over medium heat for about 3 minutes, then turned the heat off, covered the pan, and let it sit for about 6-10 minutes till the moisture was absorbed by the quinoa and the quinoa showed its characteristic spiral shape, indicating doneness. I mixed in the second batch of onion and salt, then served. Ideally, a bit of jerk seasoning would have been nice to add, too, but I knew that would cause my preschooler not to eat the dish. Instead, my wife and I added hot sauce at the table. I was very pleased and we all enjoyed the dish. This has a lot of potential; I may include this or some version of it in our annual Thanksgiving feast. The subtle color and muted but yet distinct flavor makes this consonant with a variety of side dishes. I liked the texture, as well. I was happy that all the cooking liquid was absorbed. Sometimes when I boil beets, I save the boiling water and drink it for its nutrition, but it was all kept in the dish. Yay! Jalapeno or jerk seasoning would go well, and best be added near the end of the cooking. A little bit of potato added at the beginning with the sweet potato and beet would add a welcome additional crunch and consistent subordinate flavor. From an aesthetic presentation perspective, I would use a red bell pepper instead of a green one - but the fresh roasted flavor was certainly nice. 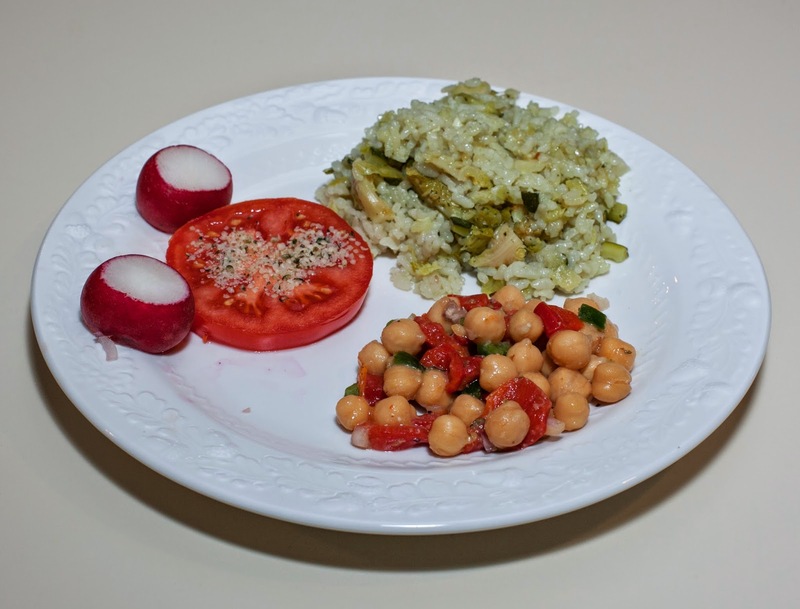 It's already a nutritious dish, but a bit of lentil added at the beginning would boost the nutrition even more and add some nice texture and flavor. A little garlic added with the quinoa could be nice. 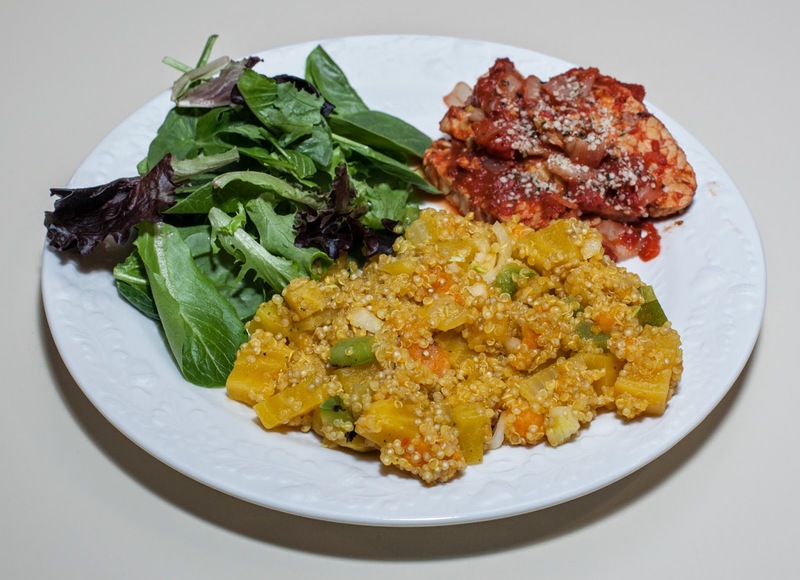 This is a winning dish that can be modified and customized! Since I've been teaching Food for Life classes the last year and a half or so, I rarely use oil in my cooking. However, I haven't found an effective way to brown to a crispy texture either tempeh or seitan. I still usually cook these without oil, but once in a while I use oil very sparingly with them. Today, I put a small amount, 1 or 2 teaspoons of extra virgin olive oil (which amounts to 4.5 or 9 grams of fat) in a cast iron pan, heated up over medium heat, and put the tempeh in, cooking each side to a light brown. 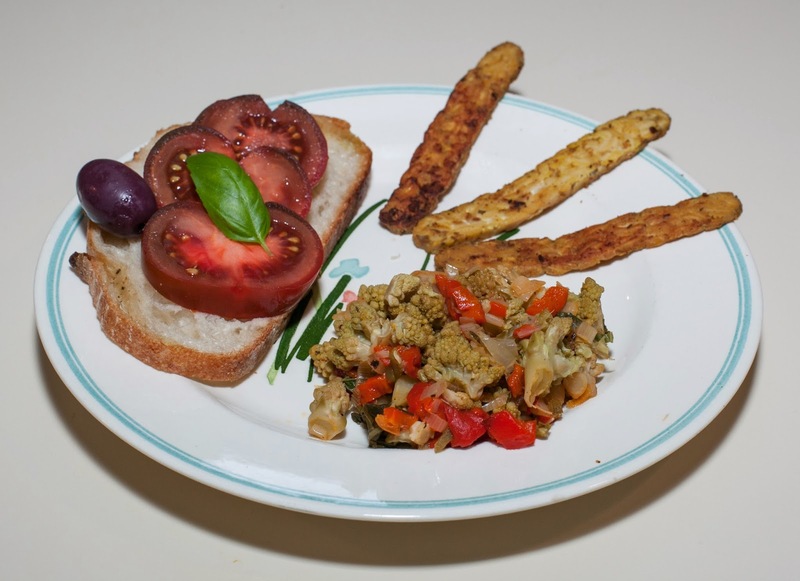 I was originally going to serve browned tempeh on the side, but as I was cooking, I decided to serve it with a tomato sauce; given that, the tempeh would have been just as good without the oil, so I regret using the oil. Even still, I made enough for three servings, so that's about 3 grams of fat per serving, which is very reasonable. When the tempeh was browned, I transferred it to a small sauce pan and mixed in the tomato, frozen basil cube, and salt, and simmered on low heat for 10 minutes or so, slightly reducing the tomato. 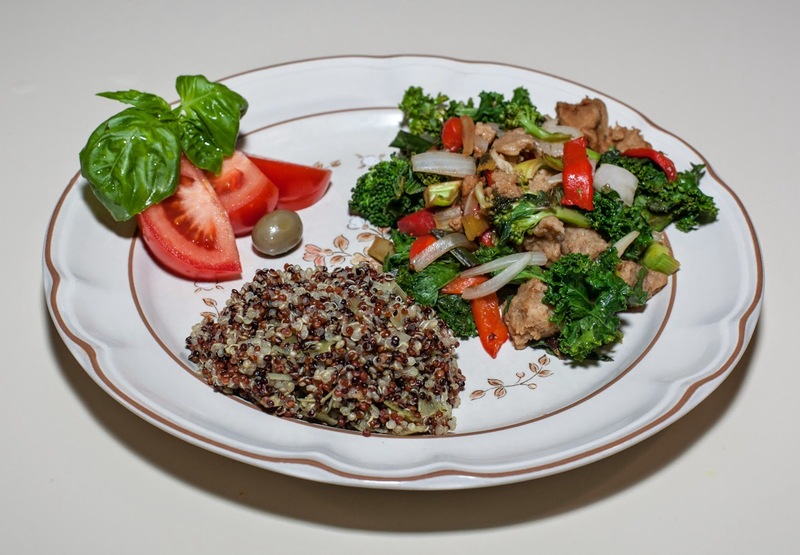 I served with hemp seed sprinkled atop the dish. This, too, came out well. It was a nice variation on simple sautéed tempeh. Certainly, especially given that the tempeh was served with a sauce, oil wasn't needed, so I would do a no fat added saute of the tempeh. A little bit of vegan parmesan (blend equal parts of almonds and nutritional yeast, then add salt to taste) would be good on top of the dish, as well as a basil leaf.